The fresco was created by the great Italian artist and sculpture from 1508 to 1512. It is located in the Sistine Chapel in the Cathedral of St. Peter and is located on the ceiling. Michelangelo is known worldwide for his paintings and sculptures. But the most memorable and deep are the frescoes for religious reasons, dedicated to the main biblical events. One of these creations is a fresco with the prophet Jeremiah. He was a Jewish prophet who lived in ancient times 7-6 BC. Jeremiah was born near Jerusalem in the city of Anaphora. His sayings are recorded in the Book of Jeremiah and in Cry of Jeremiah. This is one of the four biblical prophets. His sermons were written by the associate Baruch. Jeremiah was persecuted, was held captive in Babylon for his sayings. After which he stayed in Jerusalem. After the rebellion in the city, he fled to Egypt. Jeremiah was a very gentle and good-natured person. He first began to mention after the “Old Testament” “New Testament.” He suffered greatly from being lonely because of his sermons, but the words of God did not leave his soul, he could not be silent. There was a moment in his fate when he gave up his mission and fell silent. This happened because of the loss of faith in one’s own forces, since no one wanted to listen to him and in every possible way humiliated Jeremiah. He appealed to God, sought an answer. He felt bad, he wanted to go forever into the wilderness, to become a hermit and there devote himself to faith and prayer. Jeremiah carried the will of God to the people, also performed various symbolic acts that were supposed to predict the deplorable future of the people. The authorities did not tolerate and humiliated him for urging them to change the course of government in a different direction. As predicted by Jeremiah, the collapse came. The prophet was born in the family of a priest and became involved in early prophecies. 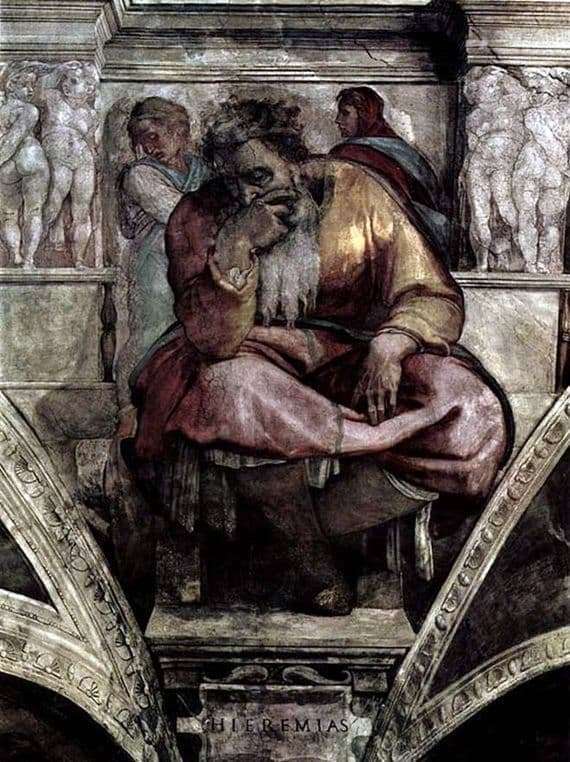 On the fresco by Michelangelo, he is depicted as a gray-haired old man who thinks sadly about the fate of the people. The depth and tragedy of Jeremiah is striking.